(Bloomberg) -- After a pretty good run, we had our first dismal trading day in over a week. Trade clouds re-emerged, reminding us that equities remain exposed to a quick change in sentiment. The dovish tone from the Fed had a very short-lived positive impact on stocks, and the S&P ended the day lower. In Taking Stock last week we mentioned that the blue-chip Euro Stoxx 50 Index was sending some mixed signals. So far the bulls have kept the upper hand and pushed the gauge above a trend line that dates back to May 2018. Now, more than 75 percent of the benchmark’s components are above their 200-day moving average. On top of that, 30 percent of the constituents are now overbought, according to technical analysis. So will success bring vulnerability? Indeed, the picture is more reassuring for the bigger Stoxx Europe 600 Index. Only 12 percent of its members are in overbought territory and sell signals are on the decline. There are still areas of gloom, such as Germany’s DAX. The benchmark is vulnerable to trade jitters as its car industry is far from being out of the woods. 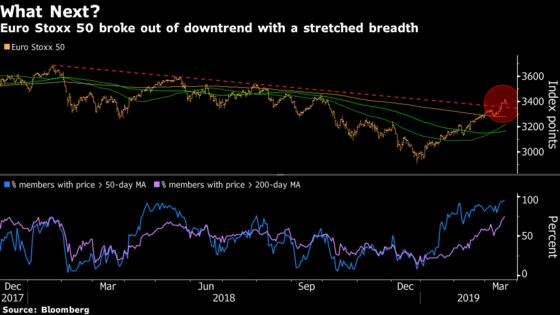 Yesterday, BMW warned earnings will fall “well below” last year’s level, adding to the woes of an already disrupted industry. No wonder the DAX is the worst-performing index among major European peers this year. And of course, there are the banks. Just as it looked like things were turning for the better, as lenders overcame the bad news from the ECB’s guidance shift, UBS killed the mood. The Swiss bank’s CEO even qualified the first quarter as one of the worst in recent history. Earnings in Europe for the period kick off on April 25 with UBS’s cross-town rival Credit Suisse. That leaves four weeks for bank chiefs to further steer the market. 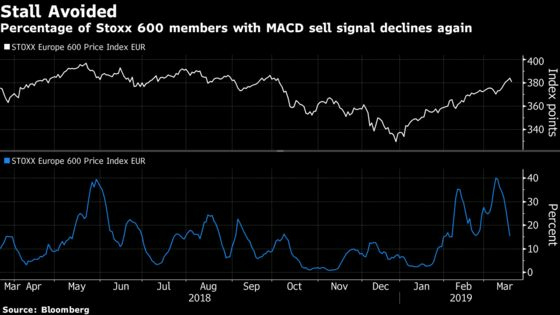 And it seems that strategists are now starting to cast doubt on the new-year rally in European equities, and expect the Stoxx Europe 600 to lose 6 percent from Wednesday’s closing levels to 358 points by the end of 2019, according to our latest survey. Grim. In the meantime, Euro Stoxx 50 futures are trading little changed ahead of the open. Watch for further impact from the Fed’s dovish stance, with no interest rate hikes coming in 2019. Treasury yields dropped to the lowest in more than a year. The central bank’s unexpected move to scrap its forecast for rate hikes this year has led to increased bets that a cut will happen. Dollar bears may be pleased, but investors are dubious. 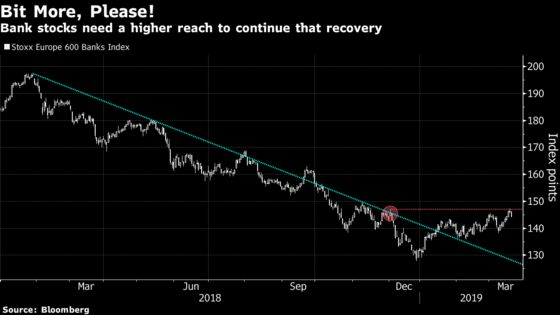 Watch semiconductors after U.S. memory chip maker Micron Technology said it will cut production in response to a slump in demand for its key products but indicated the bottom of the chip cycle is in view. Watch chipmakers like STMicroelectronics, Infineon and AMS and chip equipment firms ASML, ASM International and BE Semiconductor. Watch food-delivery firms Just Eat, Delivery Hero, and Takeaway.com after ride-sharing firm Bolt said it intends to expand into the European market. 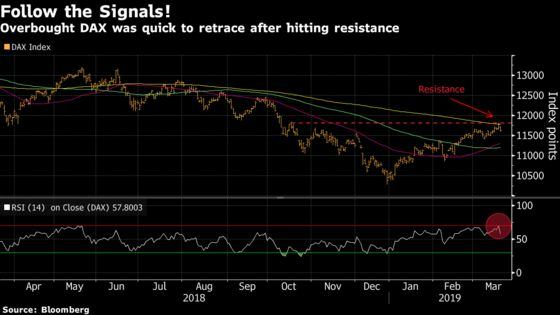 Watch the pound and U.K. stocks after the short delay requested by Theresa May pushed the U.K. to the brink of crashing out without a deal, to the dismay of British business and JPMorgan’s boss, unless May betting on a short delay forces lawmakers to act. Berenberg cut Bodycote to hold from buy, arguing the shares are fairly valued following a recovery, and adding that the industrial heat-treatment firm is “not immune” to the macroeconomic slowdown. However, the broker raised its PT to 940p from 915p. Gamma is rated a new buy at Jefferies, which sees substantial growth potential ahead, with the market continuing to shift away from legacy technologies and a new phase of adding capabilities to hosted phone systems underway. Berenberg says Merlin Entertainments may fail to achieve Ebit growth in any division this year, even with its cost-savings plan and continued investment in hotels and sites. The broker cuts rating to sell and PT to 315p.